Owasco Lake may be one of the smaller Finger Lakes, but is certainly not short on awe-inspiring views. Begin just south of the City of Auburn at Emerson Park at the northern tip of Owasco Lake. Head south on NY 38 and enjoy the dazzling foliage display as you leisurely drive down the western shore of the lake toward Moravia. 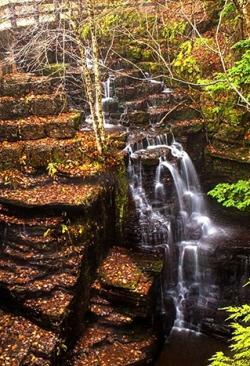 End your leaf-peeping excursion at Fillmore Glen State Park where you will find hiking trails, gorges, waterfalls and plenty of colorful vistas! 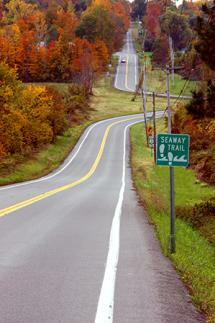 Follow the Cayuga Lake Scenic Byway on Route 90 down the eastern side of Cayuga Lake. 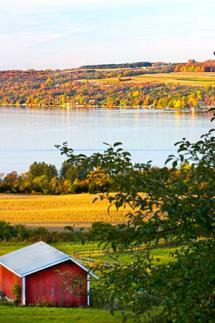 You will be stunned as you observe the pristine way in which Cayuga Lake reflects the brilliantly colored foliage. Begin in the Village of Cayuga and follow Route 90 south toward the historic Village of Aurora. Just south of the Village you will find Long Point State Park, a priceless gem of a location, the park offers ideal views and a fantastic opportunity to stretch your legs. Pack a picnic lunch, enjoy the view and let the little one test out the playground. Take the brief walk from the High Street off of Route 90 in Montezuma through this 140-acre park along the Seneca River/NYS Barge Canal to see the magnificent Richmond Aqueduct, the second largest aqueduct on the Erie Canal. 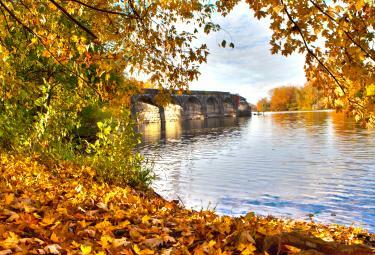 Fall is the best time of the year to view this natural and man-made landscape as the reflections of the leaves and aqueduct play upon the water. This 518-mile National Scenic Byway runs along the southern shore of Lake Ontario through the quaint Village of Fair Haven. Discover breathtaking scenery, outdoor adventure plus unique shops and restaurants as you enjoy fall foliage along the Great Lake Ontario. Be sure to visit Fair Haven Beach State Park featuring one of the finest public lakefronts in upstate New York, with towering bluffs, sandy beaches and adjoining spectacular woodlands. 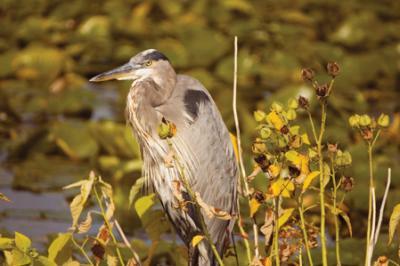 A year-round destination, this 7,000 acre wildlife refuge is particularly enticing from mid-August to mid-October when you will not only see amazing fall foliage but also have great opportunities to view shorebirds passing through the refuge on their way south to their winter homes. Killdeer, yellowlegs and plovers feast on the exposed mudflats and thousands of geese and waterfowl can be seen along with eagles and other birds of prey.